"Thanks for an awesome trip and boat ride through the Grand Canyon. The rapids were great and you made them seem so easy to manage and ride. The food was the best I've had on a multi-day trip, and even though you made me get up at 5:30 AM I still loved every second." --Brett H.
"What a great week! I had been looking forward to this adventure for over a year. It has come and gone, but I am thankful for the memories. I loved the story telling while quietly drifting, the screams through the rapids, sarcastic jokes, and belly-fillin' food. It was wonderful. Thanks for taking care of us and smiling through it. You passion for the Canyon and her river is addicting. I have the river bug!" -- Janele R.
"To our wonderful boatmen: As our trip ends I have so many fond memories. Brandon, Justin, and Randal are the ultimate pros both on the river and off. Terrific food, story telling, and most of all a great river run. As my first whitewater rafting trip I did not know what to expect. The beauty and power of the Canyon far exceeds all of my expectations. But it can only happen with a great crew! I really appreciate the extra time and entertainment given to my kids. Thanks, Justin, for keeping up with them and keeping them safe on the side trips. My hope is maybe my kids will bring me back sometime." -- Jeff M.
"This trip was 'once in a lifetime' for us -- I have always wanted to see the Grand Canyon and I feel that I have seen it the best way possible -- starting at the top, walking down and then living on the river for five days!!! How incredible! Even better to share this with our family, especially the kids. Thank you SO much for making this adventure unforgettable for Ian and Casey in so many ways. The stories, the hikes, the fun, the food, the stories--LOL! It was great! 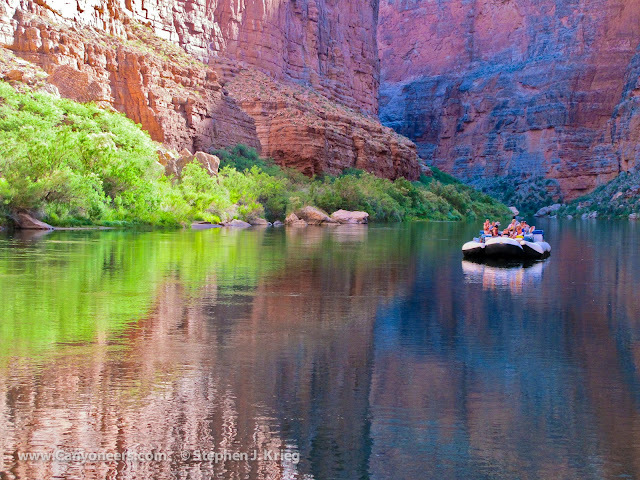 The beauty of the Canyon and the passion you all have for it is awe inspiring!" -- Steve and Michelle T.
"I was hating life when I got to the bottom of the Canyon and swore I would never do this again. You three changed my mind and now I am thinking of bringing my son when he gets older. I can't wait. The grub was great! And the stories were even better. See you in a few years." -- John P.
"This trip was amazing. You guys made this trip so much more enjoyable. I guess we're all like one big happy family. The only reason I woke up at 5:30 was because of your food. I hope you have many more great rafting trips to come." -- Heather M.